What’s the deal with my blog’s name? It’s a derivation of “Bluestocking” (described below), as in an ultra mega Bluestalking. It’s also a way of differentiating myself from the other “Bluestocking” blogs and other sites out there. A bluestocking is an educated, intellectual woman. The term most often refers to a specific group of 18th-century intellectual women led by the hostess and critic Elizabeth Montagu (1720-1800), the “Queen of the Blues”, and including Elizabeth Vesey (1715-91), Hester Chapone (1727-1801), and the classicist Elizabeth Carter (1717-1806). In the following generation came Hester Lynch Piozzi (1741-1821), Hannah More (1745-1833), and Frances Burney (1752-1840). Until the late 18th century, the term had referred to learned people of both sexes. However it subsequently was applied primarily to intellectual women, and the French equivalent bas bleu had a similar connotation. The term later developed negative implications, and in some instances such women were stereotyped as being “frumpy”. The reference to blue stockings may arise from the time when woollen worsted stockings were informal dress, in contrast to formal, fashionable black silk stockings. Curiously, the most frequent such reference is to a man, Benjamin Stillingfleet, who reportedly lacked the formal black stockings, yet still participated in the Blue Stockings Society. John Amos Comenius referred to bluestockings in 1638, deploring how women had been excluded from higher education in ancient times. The name may also have been applied in the 15th century to the blue stockings worn by the members of the Compagnie della Calza in Venice, which then was adopted in Paris and London; and in the 17th century to the Covenanters in Scotland, who wore unbleached woollen stockings, in contrast to the bleached or dyed stockings of the more affluent. The Blue Stockings Society was a literary society led by Elizabeth Montagu and others in the 1750s in England. This society was originally founded by women, and included many prominent members of English society, both male and female, including Harriet Bowdler, Edmund Burke, Sarah Fielding, Samuel Johnson, Elizabeth Montagu, and Frances Pulteney. 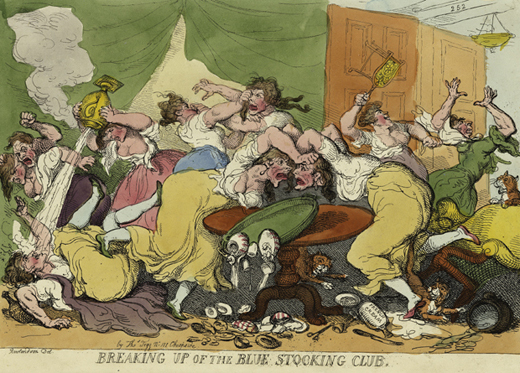 M.P., an 1811 play by the Irish writer Thomas Moore, was also known as The Blue Stocking. It contained a character Lady Bab Blue who was a parody of bluestockings.